On Monday, November 5th, Christopher Andrew delivered the first of his three-part Henry L. Stimson Lecture series on the history of global intelligence. 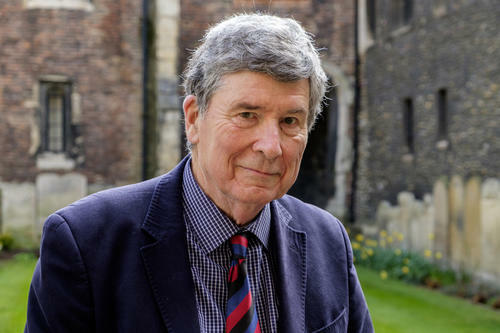 Andrew, a professor emeritus at Cambridge and the former official historian of MI5, has certainly had ample time and opportunity to reflect upon this storied, but often obscure subject. Andrew’s lecture, entitled “How the Lead Role in Strategic Intelligence Passed from Asia to the West” presented a whirlwind survey of the history of espionage. More specifically, his focus was on signals intelligence, information about another party’s communications. While typically construed as a modern development complete with a modern abbreviation in the form of SIGINT, Andrew argues that signals intelligence has occupied a central part in the espionage community since the inception of this profession. Beginning with the U.S. cracking of the Japanese PURPLE diplomatic cypher and the work of British codebreakers at Bletchley Park during the 1940s, Andrew delves back through history at a breakneck pace. The cryptographers at Bletchley, he states, were not pioneers in the field of intelligence, for all they may have believed themselves to be. Rather they were following in the footsteps of the Brits who cracked Napoleon’s codes in the 1800s, who were themselves inheritors of the Elizabethan spies who intercepted and decrypted communications from Philip II during the Catholic monarch’s failed invasion. At this point Andrew diverges from his telling of British intelligence history to identify more sweepingly the point at which Europe and the west in general took up the mantle as masters of SIGINT. He cites the Doge’s palace in Renaissance Venice as one of the first true intelligence service headquarters (and, in Andrew’s opinion, by far the best decorated). However even the Venetian codebreakers were deluded in their perceived exceptionality, and merely rediscovered a cryptographic method invented hundreds of years ago by an Arab philosopher by the name of Al-Kindi. Indeed, the earliest texts to reference the decisive role intelligence plays in war and statecraft originate almost entirely from Asia, not Europe. Andrew cites Hadiths concerning intelligence gathering in the Islamic tradition, the Arthashastra from India and the now ubiquitous Art of War by Sun Tzu in support of this argument. It is clear, according to Andrew, that although somewhere along the line Europe came to appear as the paragon of SIGINT collection, western intelligence professionals undeniably benefited from standing on the shoulders of giants. While Andrew employs a dizzying array of examples to demonstrate his points, ranging from Guy Fawkes to the gender dynamics of MI5 to the Duke of Wellington’s service in colonial India, his central argument remains a relatively simple one; there can be no future for an intelligence service which refuses to learn from the past. By this Andrew does not merely suggest the history of clandestine operations within one’s own country, but the tradition of espionage from the present to the Art of War and perhaps even beyond. Furthermore, the way in which these histories are perceived plays a vital role. Andrew points out that even meticulously compiled works, such as the six volume official account of the Russian intelligence services, can prove counterproductive when rendered in an uncritical light which leaves little room to learn from past mistakes. An appreciation of the big picture, both in terms of current events as well as the sweep of history, is therefore necessary for an intelligence service to avoid the pitfalls of selective amnesia and relapse into decidedly ineffective strategies.